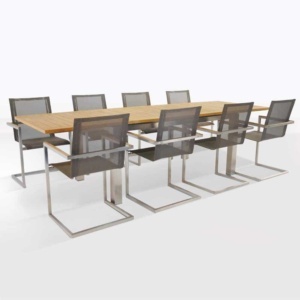 Keep it chic, and keep it contemporary with the Raw Concrete Table & 8 Box Chairs Set; another superb modern setting with the combination of Raw Concrete and Plasteak. The Raw Concrete Table and 8 Box Chairs Set create a minimalistic and elegant dining experience for both indoors or out. 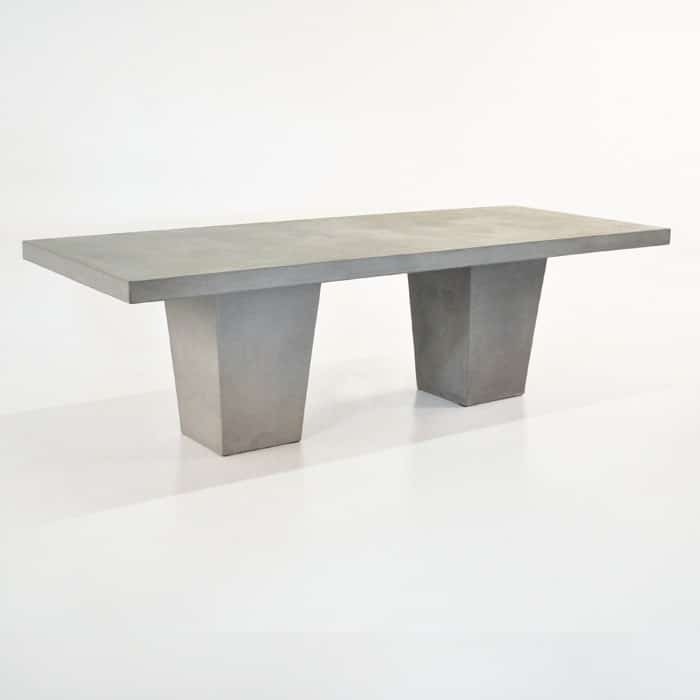 Raw Concrete has become an instant hit in outdoor furniture because it is both industrial and stylish, configured into amazing pieces by Design Warehouse. We use a concrete composite; which means that while the furniture looks and acts like concrete; it is stronger, lighter and longer lasting! 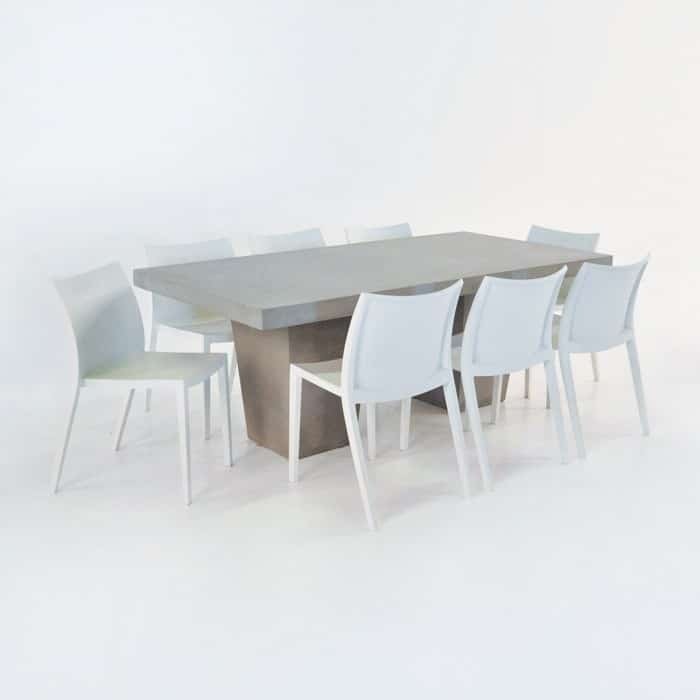 Keep it chic, and keep it contemporary with the Raw Concrete Table & 8 Box Chairs Set; another superb modern setting with the combination of Raw Concrete and Plasteak. The Raw Concrete Table and 8 Box Chairs Set create a minimalistic and elegant dining experience for both indoors or out. Raw Concrete has become an instant hit in outdoor furniture because it is both industrial and stylish, configured into amazing pieces by Design Warehouse. We use a concrete composite; which means that while the furniture looks and acts like concrete; it is stronger, lighter and longer lasting! Plasteak is our UV treated polypropylene resin product that is featured in restaurants, cafes and homes all over New Zealand, so easy to maintain – just hose or wipe it down when dirty! This superb modern setting is just one of many at Design Warehouse. Mix and match materials for the desired effect. Try some Batyline® mesh with your raw concrete for a plush contemporary vibe. 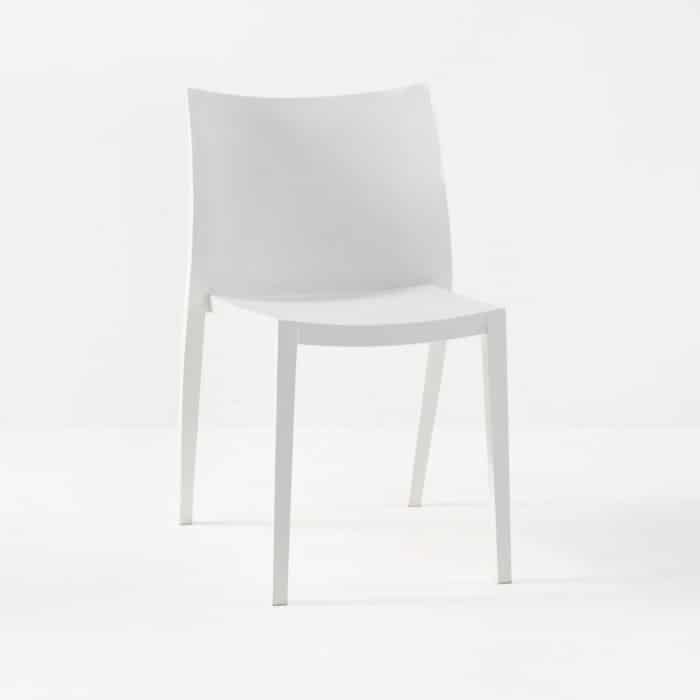 Or keep it fresh with one of our great range of Plasteak, polypropylene chairs. We love seeing the Raw Concrete contrasting brilliantly against hard wood floors, or nestled amongst nature in the garden. Try pairing up this 2 metre by 1 metre Raw Concrete Tapered Table with wicker or teak to add some more texture to your area.Have an amazing seaside bach? This Raw Concrete Table & 8 Box Chairs Set is perfect! The Raw Concrete is perfect for the seaside property. Design Warehouse has the greatest range of marine grade outdoor furniture in Australasia, and we ship all over! From the pacific islands, to the USA, to all over our beautiful country; we are proud to offer such a stunning, high quality range of products at wholesale prices. 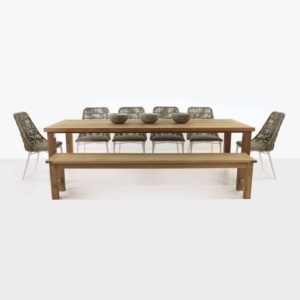 Whether you desire Grade-A Teak, All Weather Wicker, Raw Concrete, Plasteak or Stainless Steel – we have dining tables, chairs, deep seating… everything you could possibly imagine you’d need for outdoor recreation and living spaces. 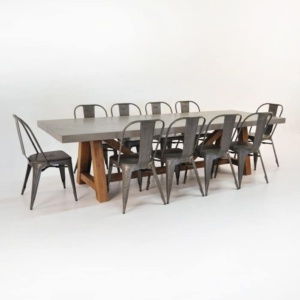 The incredibly chic and contemporary Raw Concrete Table & 8 Box Chairs Set is a must for the household that craves a delightful dining area that adds style and panache to any patio, verandah or garden! Team up this set with one of our wicker deep seating collections for a interesting mix of materials. Try for a clean, polished look with our Grade A Teak with a Grey or Taupe cushion to tie it all together. Have questions? Never fear! Design Warehouse is open daily in Auckland’s CBD. Come on in or phone us up for help in creating a divine collection to suit your space!